Is your company or retail institution searching for large and prevalent outdoor advertising displays? 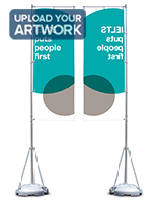 These flag banners are very popular promotional options that feature towering pennant stands and custom images. Standing at over 13 feet high, these flagpoles provide an excellent method for drawing consumer attention and promoting brand awareness. 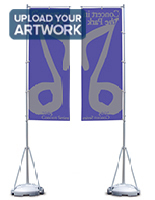 Utilize these flag banners at live concerts, carnivals, car dealerships or other public affairs! Each advertising display presents a sign measuring 94-1/2" long by 31-1/2" wide. 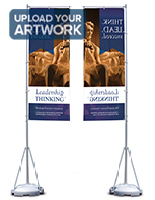 With such a sizeable presentation area, these flag banners, also called feather banderoles, supply a fantastic way to showcase sponsorship, new objects or upcoming events. While they are designed especially for outdoor use, these custom signs and flagpoles will withstand moderate weather conditions. In addition, the flag banners remain stable in winds up to 31 miles per hour. With appropriate care, these unique displays will endure years of use without fraying and or apparent fading. 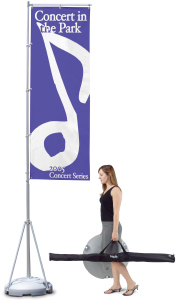 Although perfectly suited for the outdoors, these flag banners are equally functional indoors. Interior applications incorporate shopping malls, business lobbies, atriums and tradeshow events. 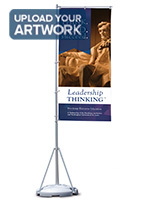 These advertising stands, flag banners with graphics are built durably with lightweight materials for easy assembly and transport. Each flagpole set has an aluminum telescoping support that can be extended upward by just one person. The design also collapses down for trouble-free relocation. 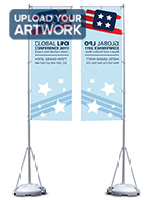 Another fantastic feature is the horizontal flag armature, which enables signage to pivot with the wind. This capability helps to disperse wind loads while creating an aesthetically pleasing motion that attracts clients. The bottoms of the flag banners and flagpoles have three-leg support systems and fillable bases that prevent the displays from tipping over or sustaining damage. Fill each base with up to eleven gallons of sand or water for even more stability. A convenient travel bag is also included with each set to provide an easy way to carry the entire unit to and from events. In order to provide you with the best objects, our company has researched many promotional printing options for the feather advertising flags. Only the most rugged knitted polyester fabric is used with these flag banners, as the material is difficult to rip or tear. These materials also allow for a "through print" technique when you advertising flags are only printed on a single side. A printed flag with a single side is characteristically easy to see. Two-sided pennants are generated by using two imprints and sewing them together. This back to back design is ideal for customers that desire right reading images on both sides of their signage. Silk screening and digitally printing artwork are the two methods presently in use, although, there is a third option called dye-sublimation that combines digital printing with heat and pressure. This process results in very brilliant coloration and enhanced durability. These procedures are detailed below to help customers decide which manner is most optimal for their applications. 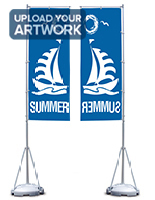 For any silkscreened flag banner, a 10 unit minimum is required. These promotional signs are better for straightforward designs and logos with little detail. There is a choice of 1, 2, 3 and full coloration for these graphics. See the vector artwork submission link for further information on designing images. Vinyl imprinted teardrop displays feature colors that penetrate the fabric for mirrored imagery on the reverse side. Even though they are through-printed, the decorative feather signs are just as bright on both sides. Due to the high cost of setup, silk-screening is best for larger quantities of the same design, and pricing begins at ten pieces. Silkscreened teardrop displays produce vivid presentations. With one, two, three or complete-color options, the signage possibilities are endless. Pantone colors can be matched most accurately, so it is recommended that submissions use this color style. Heat-transfer prints produce colored images that rival the quality of digital printed advertising flags. The largest limitation of this technique is the minimum quantity requirement. A digitally made print does not have a minimum batch qualification. Photographic images are quickly rendered using digital printing. This option is the best choice for more complex designs, such as artwork with gradients. These models can be printed as single or double-sided displays, although, through-printed models generally experience a 15% fade on the backside. The dual signs are manufactured independently and then affixed to one another later. Digital prints are your only choice for quantities under ten. A large format printer is used to print the image directly onto the knitted polyester, fabricating through prints that are 70-95% as bright as the front. Of course the brightness can vary greatly even within the same emblem because darker colors generally have better results than lighter ones. Dye used on a one-sided printed flag results in full shades for both panels, and there is no min purchase. For this reason, lots of customers revel this preference. Digitally printed flags are generally more expensive than vinyl imprint flags, yet are your best choice for nine or less complex designs. Displays2Go.com is a leading supplier of promotional equipment, including advertising flags, printed pennants and flagpoles. The entire collection has many different styles, like feather, flying, bowhead, teardrop signs and hardware. These promotional fixtures are an ideal way to direct messages to a specific audience. Look through the online store today for wholesale signs. If you have questions concerning your order, our consumer service department is open Monday through Thursday from 8 a.m. to 6:30 p.m. and Friday from 8 a.m. to 5:30 p.m. EST. While online, participate in a live chat with an expert. You can also contact us by dialing 1-800-572-2194. If these hours do not work for you, just send us an Email. We will respond as quickly as possible. With our fully-stocked, on-site warehouses, we can offer same-day shipping on much of our objects. If your order is in stock and is placed by 3PM EST, the merchandise ship the same day. Same-day shipping is not offered on freight-shipped or custom orders. Any business or establishment will benefit from the best feather models, flagpoles and teardrop fixtures available in our wide-ranging web inventory!